Last weekend we were in McMurray (it was hair cut/color day) and since our friends who live there couldn't meet us for lunch, we looked for somewhere new-to-us to try for lunch. 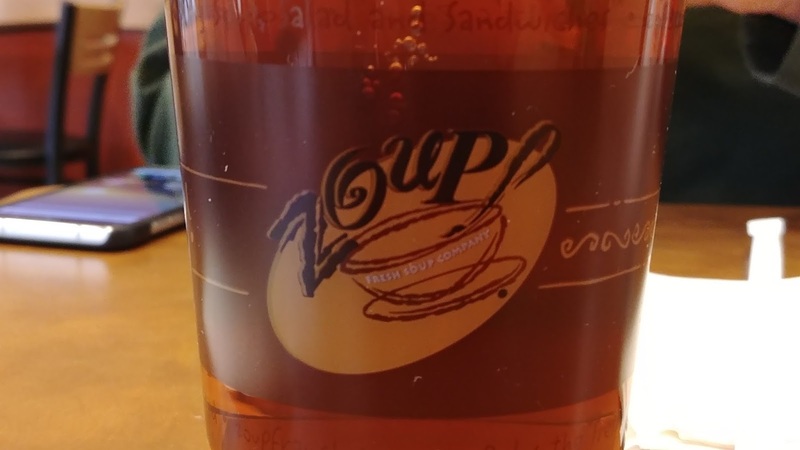 We settled on Zoup in Southpointe Towne Center. We had never before driven through Southpointe, so that was a "new" thing for us. Office building, apartments, stores and restaurants, a golf course, all shiny & new. It was pretty breezy and chilly when we got there, just starting to sprinkle, so soup was sounding really good. 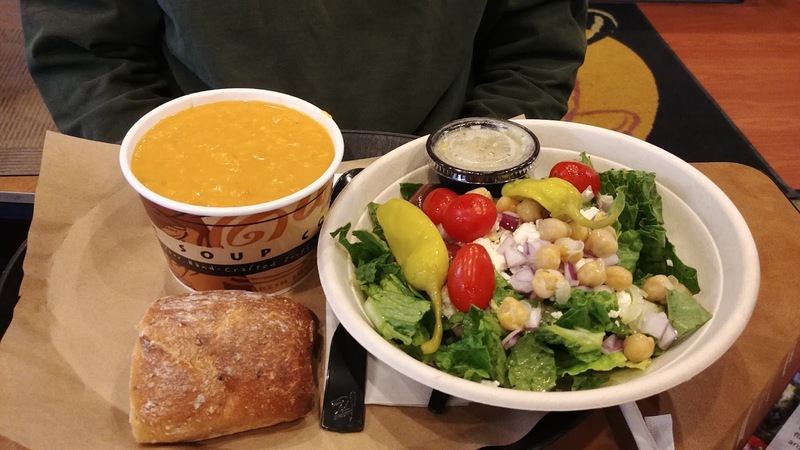 The ladies at the hair salon had told us that at Zoup, you can sample the soups, so we did. I tried Crab Bisque and Lobster Bisque (mellow, real-cream soup with lobster, crawfish, butter and a hint of sherry). I can't find the Crab Bisque description online. Their soups change daily and I guess that one isn't offered today. 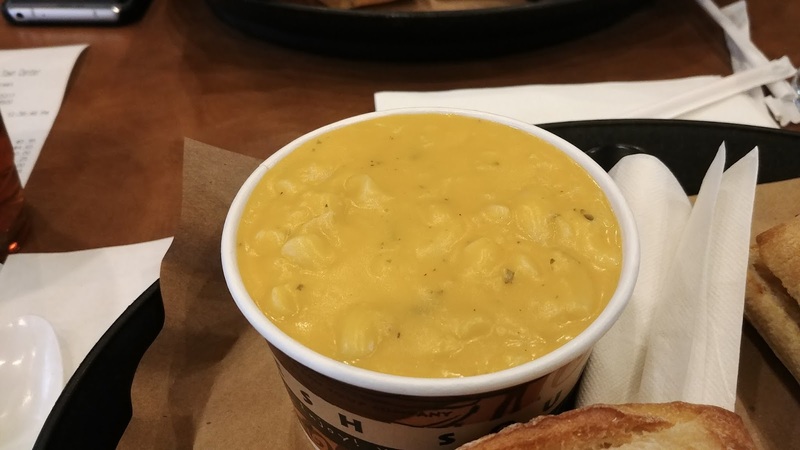 I also tried a bit of SP's sample of Dill Pickle Chowder (creamy potato soup in veggie broth with dill pickles, carrots, celery and fresh dill). Interesting flavor combination, and I liked it, but I don't think I could eat an entire cup/bowl of it. SP chose the Crab Bisque and Greek Salad (romaine, feta, red onions, Kalamata olives, grape tomatoes, garbanzo beans & pepperoncini, served with Greek dressing). He said both were tasty. The soups come with a chunk of bread, multi grain or white. He chose multi grain. 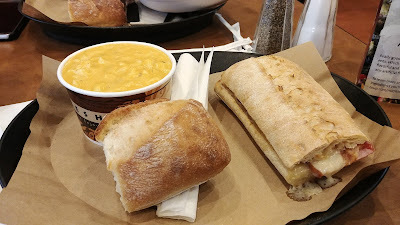 I chose Mac & Cheese Soup with white bread and the Maple Ham & Bacon Sandwich (smoked ham, hickory smoked bacon, Swiss & maple aioli). Mac & Cheese Soup is just like macaroni & cheese, maybe a little more liquidy, but not much. It was tasty, warmed me up, and made my tummy growling stop. The sandwich was tasty, too, but it could have used a little something else, like maybe some mustard, or tomato/lettuce. We both enjoyed our lunch. It wasn't too crowded and it was quiet, so that was nice. The guy behind the counter was friendly and happy to help us sample soups and order food. Our food was good. It was a nice change from Panera or Wendy's, which are our usual post-haircut quick lunch spots. We'd go back. My one negative: they don't have hot tea (or coffees, or fresh brewed tea) but there is a Crazy Mocha across from it (but sadly it wasn't open on Saturday - it's apparently not open on weekends).